You can start learning more about Gouldian finch care today when you subscribe to my “Lady Gouldian Finch Tips” free magazine. We welcome contributions from our readers, so feel free to send us any ideas or tips that have worked for you, and it may be included in our newsletter. Each issue is emailed out once a month, and we don’t send you “special editions” every 10 minutes advertising the latest gizmo, like some websites do. 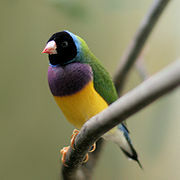 You get your newsletter only once a month, and it will be chock-a-block with a valuable selection of Lady Gouldian Finch Tips and Breeding resources for you to enjoy. And as a special “Thank You” gift for when you confirm your ezine subscription you also get an instant ebook download link to my “Lady Gouldian Finch 14 Health Care Tips” free Report with some of my best Gouldian Finch Health Care ideas. Since 1990 I have acquired a wealth of experience and knowledge on this subject and it is with this site that I am eager to make that information easily available to all who are hopeful and caring owners of Lady Gouldians. I have compiled some of my best tips into an Gouldian Finch Tips ebook that you can download as soon as you subscribe and confirm your subscription. I know that you will thoroughly enjoy the free monthly ezine, and get plenty of helpful tips from my ebook! Thank you for subscribing – just complete the form below and your ebook download link will be sent to you as soon as you confirm your subscription. By the way, if you ever change your mind, just click on the “unsubscribe” link at the bottom of newsletter, and you are AUTOMATICALLY unsubscribed.